Which Photo To Choose: Some venues can be 'target rich environments" for far as cool shots are concerned. I tend to overshoot my assignments, bring back more technically suitable images than needed. This means that at some point, I'll need to make some hard decisions on what photos to send, and which to retain. Writing the caption is still an issue, since I'll need to identify everyone in such shots, along with their titles as the pertain to the event itself. Before I go into why this shot was submitted, you'll need to know the back story. This charity event had two important components: The award to a worthy member of the community, and a famous guest speaker. Since this is a local paper, the community aspect takes precedence over a film star, in most cases. Tonight, the award recipient's personal and professional achievements made a more compelling story, so it's where I concentrated my efforts when it came time to submit the money shot. 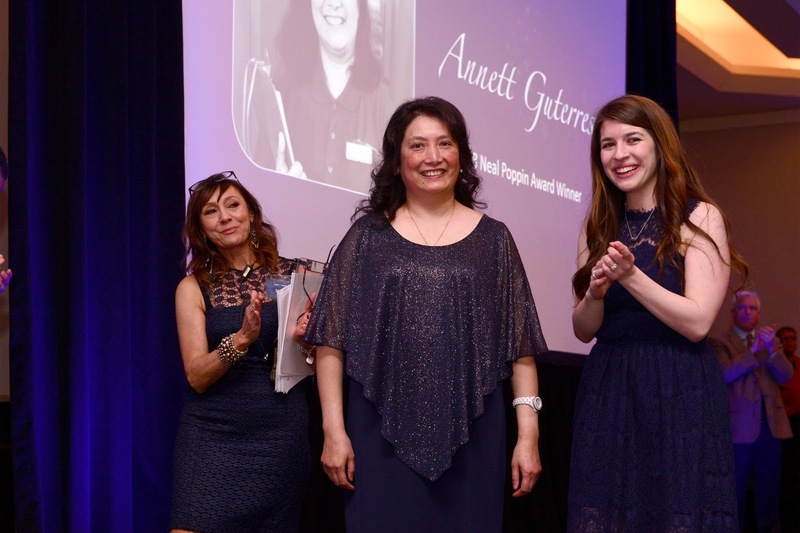 My submission clearly shows the honoree's name on the PowerPoint slide behind her, and two of her supporters are seen applauding behind her, who were named in the caption along with their professional roles in helping Annett achieve her personal and professional goal. I submitted Photo #1. 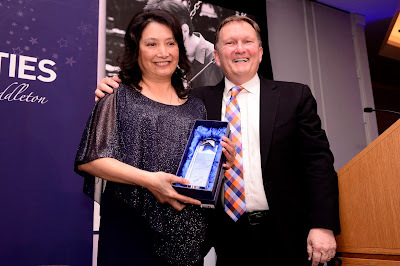 Photo #2 was not sent, although it shows the actual award and the President and CEO of the Charity. It came down to giving recognition to a member of the leadership committee, or recognizing those who actually had a hand in helping Annett. Also, the background signage was a bit distracting, which is another reason to not send it. Truth be known, either photo would have been perfectly acceptable, but my choice was based on a belief that the little recognition my small photograph would provide would go to those who worked hardest to achieve it. The Context Game: One final note about photo selection. Context helps build the story at the center of the photograph. One exercise that is often used by educators to evaluate a student's ability to communicate involves showing a picture to a subject and asking her/him to describe what they see, and more importantly, what they think is happening. If I presented both photos to a child, I'm confident I'd get a more relevant description from my first choice than I would from my second. Patrick Dempsey: The guest speaker was Gray's Anatomy star Patrick Dempsey (Photo #3) , who was called up to replace another star who cancelled at the last moment. As is frequently done by this organization, a local media start is chosen to serve as a mediator in discussion about topics appropriate to the setting. The discussion that followed gave the audience some interesting insights into one television star's navigation of his personal journey through his life in the world entertainment, and his personal understanding of the many clients helped by the organization. His ready smile allowed me to make some pleasant photos, but nothing I would submit for publication. Still, it's good practice in learning to predict when a "magic moment" is about to happen, even if it's just a sincere, engaged smile. This wide shot (Photo #4) wouldn't make the paper for number of reasons. First, the subjects are too small to be recognizable when published. It might do if the logo "Power of Possibilities" was important, as it might be for the heading on an in-house web posting about the event. It also suffers from the placement of the moderator, who appears larger than Mr. Dempsey due to their proximity to the wide angle lens. Also, Mr. Dempsey's gaze is towards the moderator, making her appear to be the more important personality of the two. Odd Angles: I'd like to get some points across before I close this post. You need to be as inconspicuous as possible during these presentations. The people sitting at the front tables paid a lot of money to sit close to the action, so I try to keep as low a (physical) profile as possible. By evening's end my knees were killing me because I avoided standing unless it was absolutely necessary, lest I block somebody's view. My position when making Photo #4 was one of the few where I had a clear shot at my subjects, and I was reluctant to move if it meant leaving a good vantage point only to find my next position less than satisfactory.